There's been a lot of hype in Patterns for Pirates about this hot, curve-hugging little number. And for good reason! This is the perfect pattern for to use for professional wear, date night, or when an extra-fancy event finds itself on your calendar (I'm still waiting for my invite, haha). 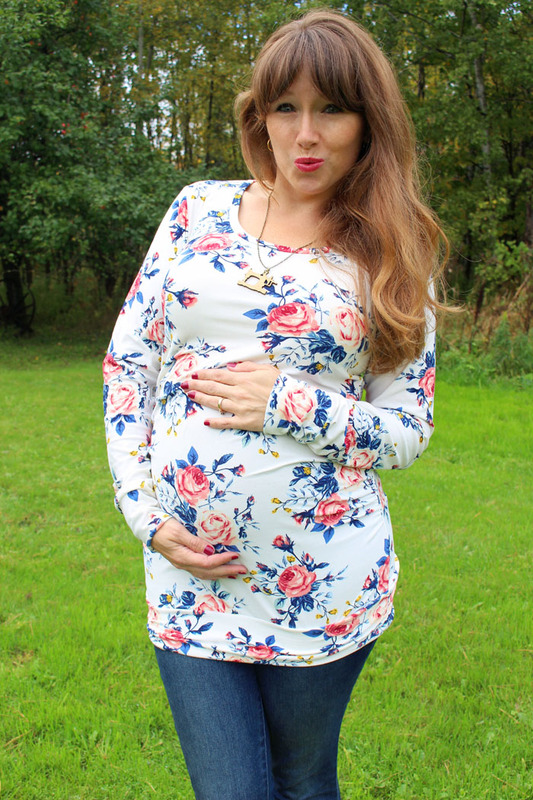 Personally, I was super excited about the Wiggle Dress because I knew it would be super easy to hack it into some gorgeous maternity wear-- and I was right! Just add their Layer Me Up maternity add-on (Kelly Bailey went over using the add-on with other patterns on the P4P blog), or your own favorite ruching hack (I shared mine here). The first one I made was from this gorgeous Liverpool from Sincerely Rylee. Above the knee, 3/4 sleeves, low scoop back. Stable knits like Liverpool are perfect for this pattern, because otherwise you'll have every lump and bump showing. And there was really only one bump that I wanted to highlight, haha. You can see the side ruching here! I integrated the Layer Me Up maternity add-on into the pattern, which alters the front piece only, adding both length and width to your midsection. 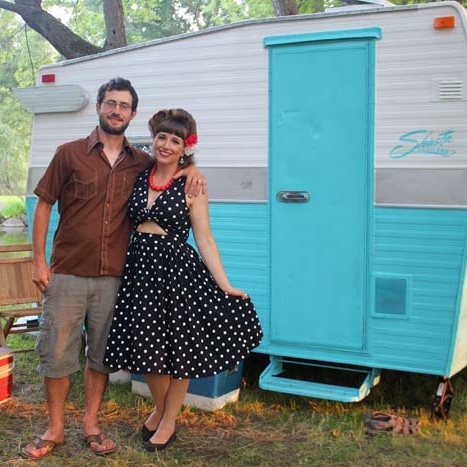 My husband and I are sneaking away for a weekend up north this weekend and I'm so excited to pack this one for our official date night. I'm also thinking it will look super cute for holiday parties this year! For my second version, I knew I had to go glam and take this opportunity to do some maternity pictures! This is the off-the-shoulder version, with long sleeves, and full length skirt. 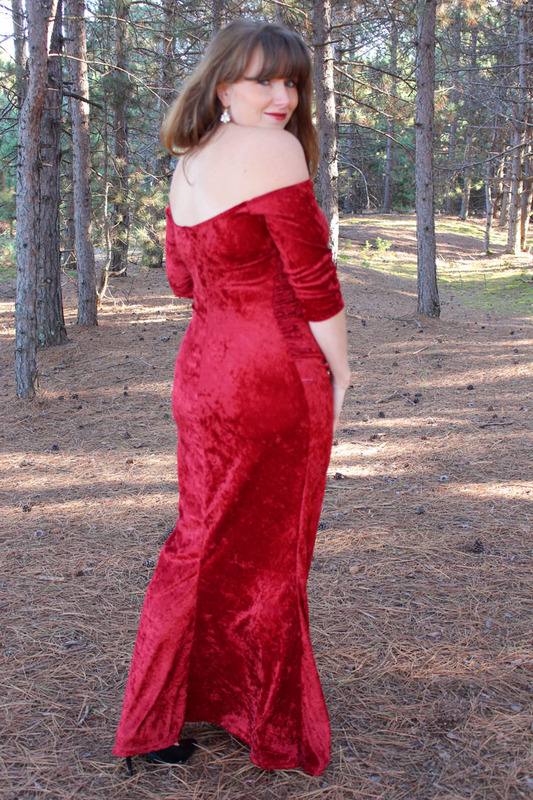 I used the stretch velvet from Jo-Ann's, which is super easy to find at a super good price (like less than $5 a yard). I also just got in on a preorder of stretch velvet from Sincerely Rylee though, because she had way more fun colors! Honestly, I'll have nowhere to ever wear this dress, haha. 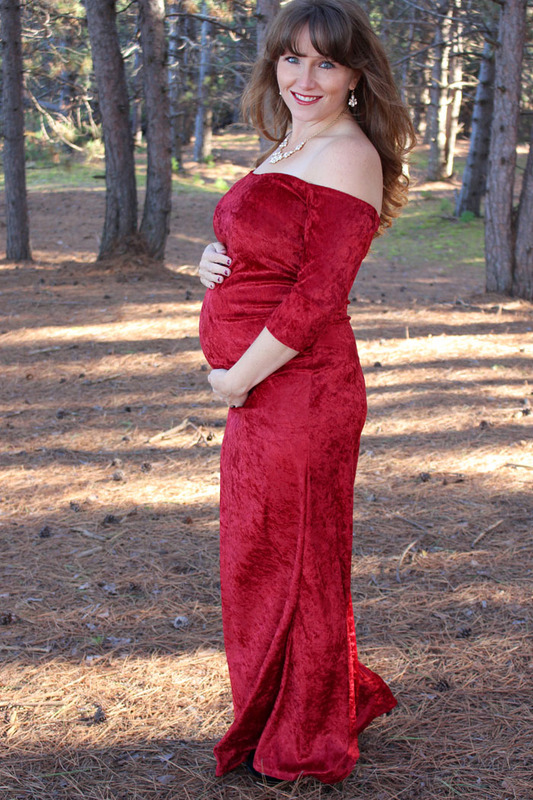 But I knew I wanted one for these sweet bump pictures. Pattern testing win! Because I would have basically no pictures of this bump if it weren't for pattern testing, haha. I was only bummed about them because I was having issues with my camera that day, which left me with 90% of them sadly blurry. Lesson learned. There is a sway back adjustment built in to hug your backside . . . make sure you mirror that back piece, or you're going to be really sad. Especially if you're making a full-length dress. Not saying that I know from experience or anything . . .
And yes, that was legitimate wind blowing my hair like a movie star-- Ha! This little wooded nook is right off of Lake Superior, and it was windy that day! Are you in love with it yet!? 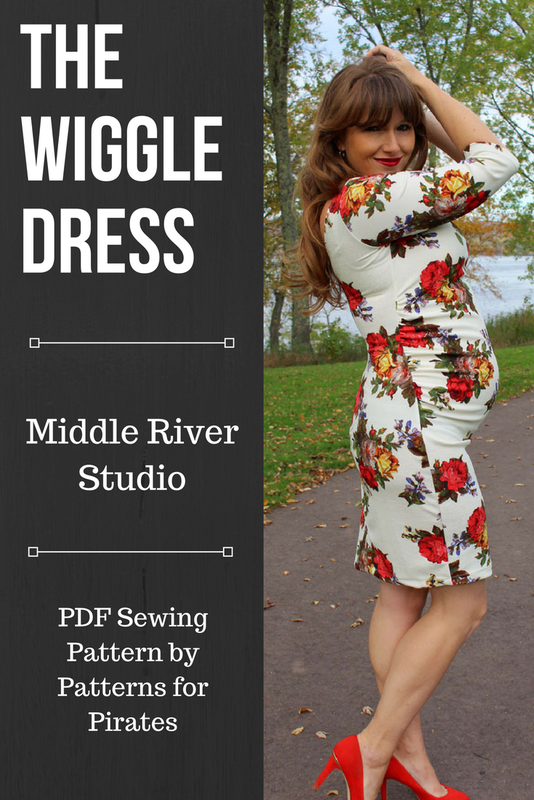 You can buy your copy of the Wiggle Dress here. Or, if you're not convinced yet, check out all of the options here, and the P4P list of easy hacks here! Hi there, I'm Molly, maker behind Middle River Studio. Thanks for finding me and enjoy your stay! Some posts may contain affiliate links, which means that I recieve a small amount of compensation if you purchase something that I've recommended. Thank you for helping to keep fabric on my cutting table and thread in my machines.